These make me wish we drank a lot more beverages outside the kitchen than we do, and/or that we hosted parties and friends at our house more often. 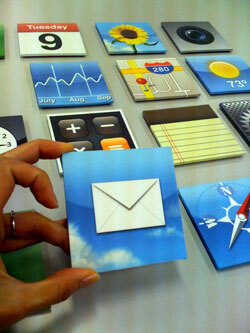 A company called Meninos (from Brazil, I think) is selling this set of 16 coasters with icons from the iPhone. Only problem is that the whole set runs $60, and shipping is another $15. OUCH. Not even this Apple fanboy can justify that expense for a set of coasters that won’t get used much around our house.